Halfway through my 30 days and the official first day of summer! And what a beautiful day it is! 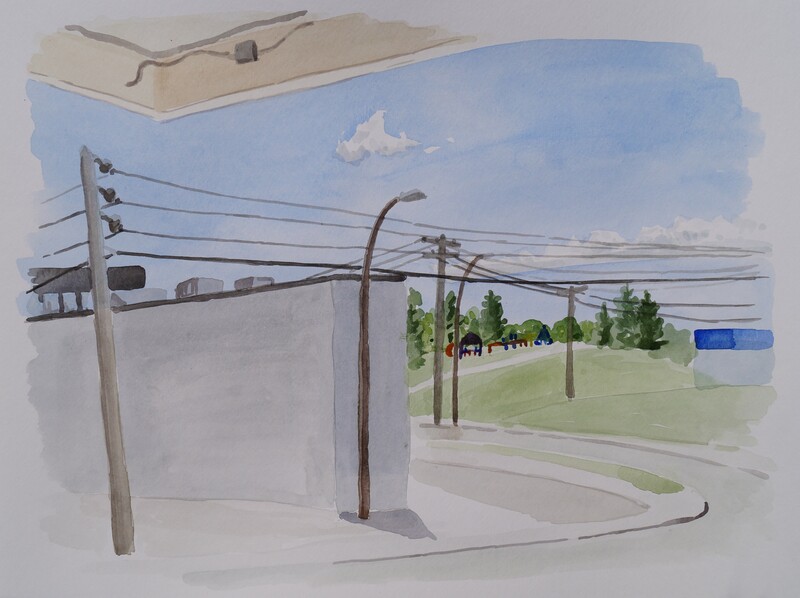 I was on my way to the park when I smelled the gyoza from Subs’n’Bubbles at the end of our street, so I decided to get some lunch and paint the view from there instead. I’ve been meaning to try doing a painting there for a while now. It was very busy and I was very self-conscious and left before I felt the painting was finished so it feels like more of a quick study. At one point a lady came in with a bunch of kids who were having a playdate together, and a little boy hunkered down beside me, said he liked my painting, and then talked to me and asked a lot of questions. He asked me to put the playground in and he really wanted me to use hot pink, but I couldn’t mix a bright enough pink for him.